For those too young to remember, this was a famous model railroad from the late 1940s to the early 1970s, built by a fellow whom many, if not most, would consider an artist. John Allen had both the talent and a bit of money to build a fascinating model railroad that looked spectacular and also featured realistic operations. It may have had what would now be called "fantasy" elements, but it all still looked good and featured many things such as special lighting effects that are now commercially available, but which required engineering and scratchbuilding in Allen's time. Sadly, this model railroad was destroyed in a house fire shortly after Allen's death--but these models were salvaged out of the house, and have been hidden away until now. It's a bittersweet thing for us old-timers to see--and yet, even in the death of the G&D, we have pretty amazing "weathering" patterns on these models, actually looking quite realistic at representing locomotives that have been in a roundhouse fire, as was the case for Reading 2101 in the late 1970s! I was not aware anything was salvaged from this famous model railroad. I am a John Allen fan. He was into the artistic aspect of modeling. Standing in the layout room must have been something to behold. 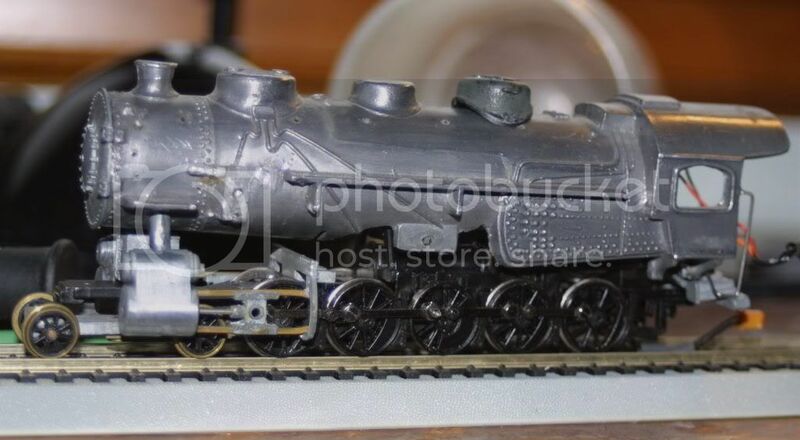 Even though those locomotives appear beyond rebuilding, one can still see some of the great innovations Allen incorperated, like pick up shoes, superdetailing, etc. It's bittersweet to see these burned out relics. john allen's influence on the hobby is deep. profound and long lasting. in his day he was like george selios, pelle seborg and tony koester all rolled into one. his was a railroad which could have been. but never was. it was one of the few cases in this hobby where a person who knew railroad practices intimately was also a great builder of scenery. I belong to a yahoo group called GandD and I'm a frequent follower of that group. 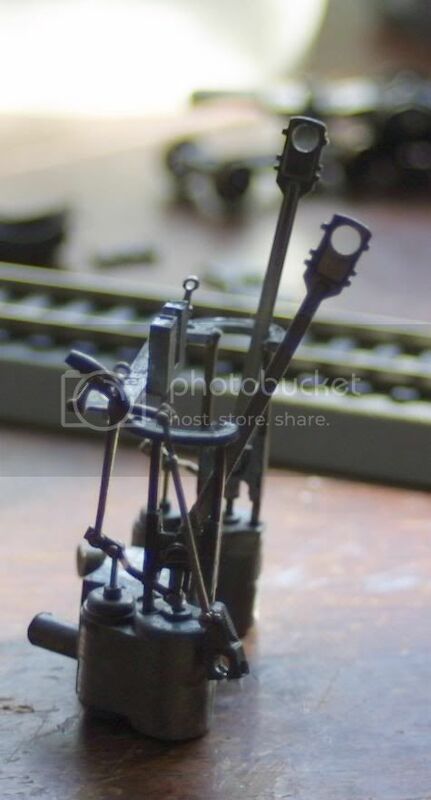 The story of the "satchel" was all the locomotives got put in a bag to be photographed and sent back to Linn Westcott but due to a series of miscommunication and photos never being released the engines sat in the attic until someone brought them up at a local convention and a guy said he had them and there you have it. for me john allen was one of my two big influences who weren't family members. 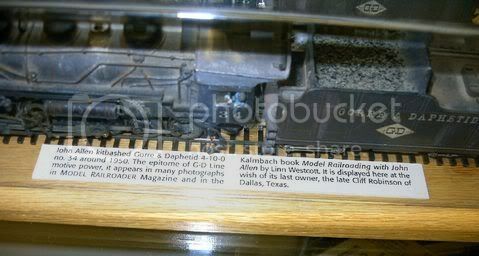 john allen's g&d represented the railroad i wish i'd seen in real life. 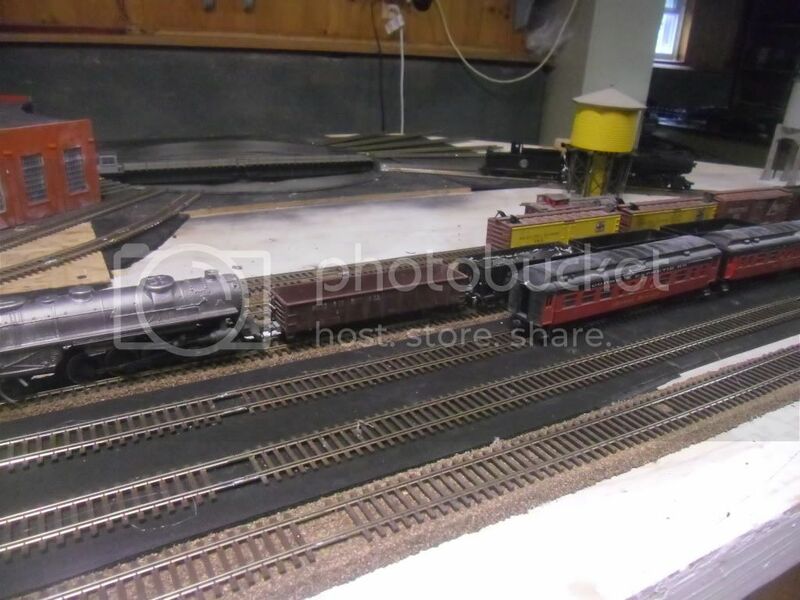 both the model, and as a real life full sized railroad. allen mcclelland's v&o (the first incarnation, the second layout was a huge disappointment) represented places i'd actually been to, and watched trains at. the scenes could have been locations on the real clinchfield, or c&o, or western maryland. i know it makes the purists cringe, but i often wonder what the g&d would have looked like as a small diesel powered line set in the mid 1970s. If you look closely at the diagram of the original G&D note the majority of the curves are 14" & 16" radius, with a bit of 18" & 20" radius here and there. So much for "18in radius minimums." that was only the original plan. also look what was run on that part of the layout. in all the photos, i don't see anything longer than a 40' boxcar on there. when the original layout was incorporated into the larger one as a branch line, it was home to geared locomotives like shays and heislers, which were designed to take sharp curves. the mainline's sharpest curve was at sims loop and was 26" radius. the mallets and 10 coupled steamers took that curve with ease. another thing john did was gear his locomotives down so that it was impossible to run them at high speeds. 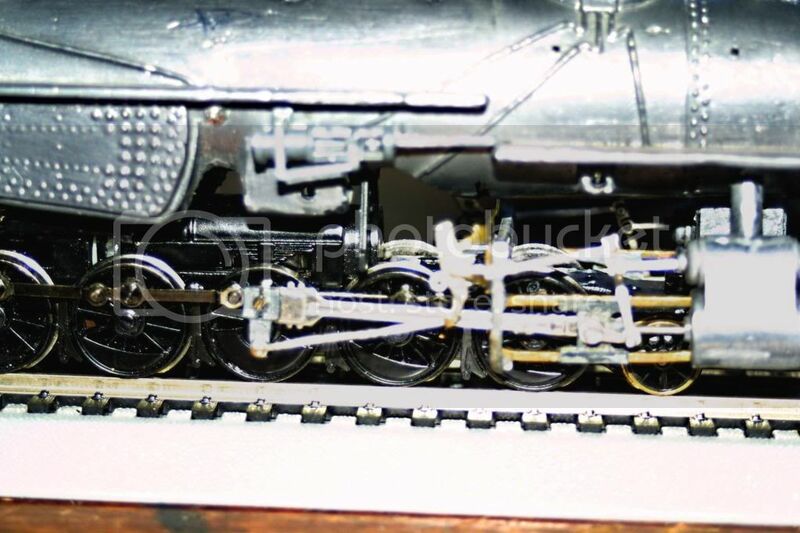 this is something i did myself in the 1980s when most of my locomotives were athearn. befoer dcc regearing was the best way to speed match. a higher gear ratio meant that differences in motor speed were reduced. I was fortunate enough to meet John on several occasions at NMRA events, and got to visit the G&D just about a year before he passed. The layout truly was something to behold. I wish I had had the opportunity to attend an operating session, but I lived on the other coast and just had the one day to visit. 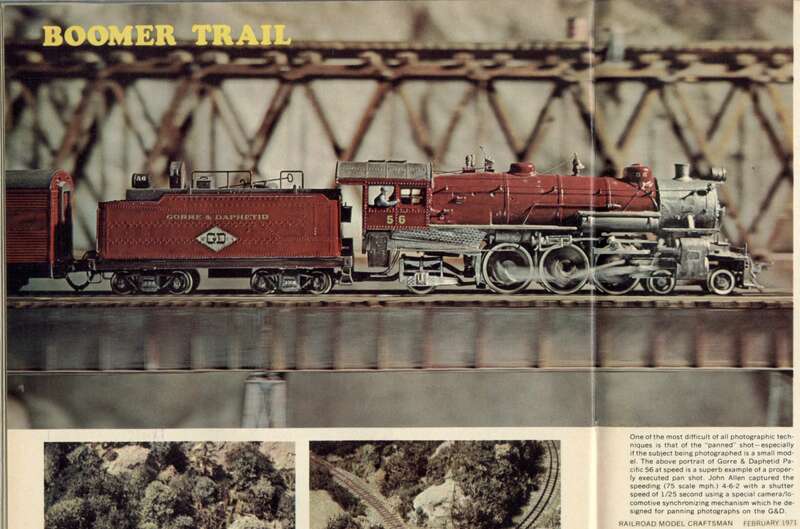 His layout and his modeling were touchstones for the hobby from the late 1940's through the 1960's. I believe he won Model Railroader's first modeling contest with his now-famous 2-stall enginehouse that had pigeons on the roof and appropriate weathering, which was almost unheard of in that time period. The original G&D layout was about 3 1/2 x 5 feet or so. John worked with Varney on their ads, and used the layout to feature Varney models (again properly painted and weathered). Those ads usually appeared on the full rear cover of MR. The somewhat expanded version of the layout was incorprated into the big layout, operating essentially as a branch line. for what it's worth, i've seen plans of the original g&d expanded to 4x8 to use 18"r curves. 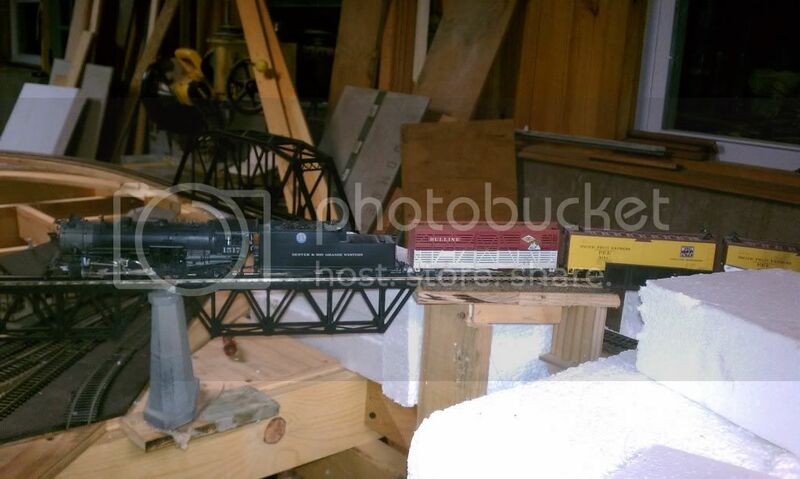 i've also seen the plan in the book 101 track plans for model railroaders. it's been done as a plastic layout form (just add track) in n scale. 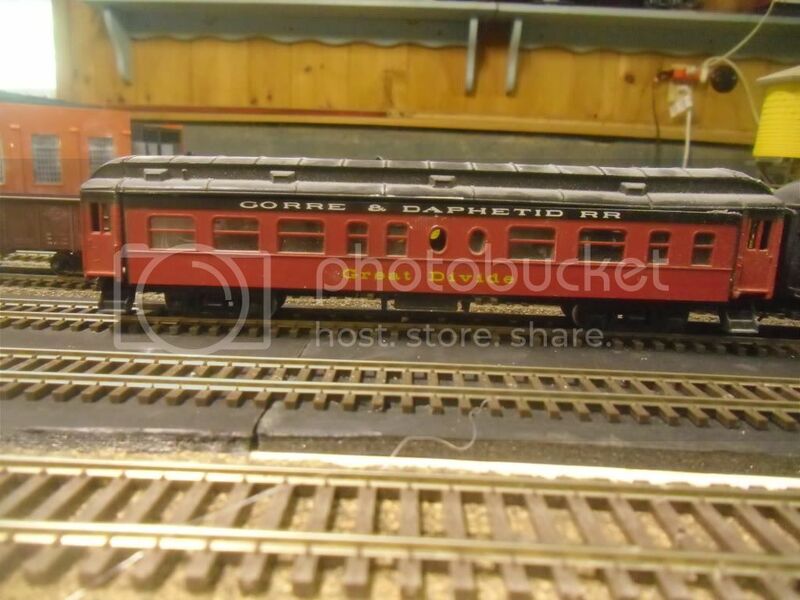 there was even an o guage tinplate version published a little while back in classic toy trains. who'd have thought tinplate had anything in common with john allen? Rye, those video clips from DG Locos (and we can guess his interest from that tag!) are amazing! It's seeing something you don't think you should be seeing, although it is not quite up to the original (and how could it be?) Of course, it is also a work in progress. . .a change in lighting might help. . .for some reason, Allen's road tended to photograph dark, or at least darker than what we often see for model photography today. . .no doubt the Wizard of Monterey had a reason for what he did. . .
Rye, I'm not totally familiar with Allen's loco roster, but did I see a second 4-10-0 in DG Loco's clips numbered 33? Did Allen have a No. 33 of any type? Did DG fill a gap in Allen's roster with a logical duplicate locomotive? Normally locomotives ordered for a railroad of any size are not "one of a kinds," but of a class, at least on a road that had the luxury of buying new engines. Even the little Ma & Pa would order engines in twos and threes. but his roster was supposed to be secondhand locomotives from other railways modified for the Gorre and Daphetid route. 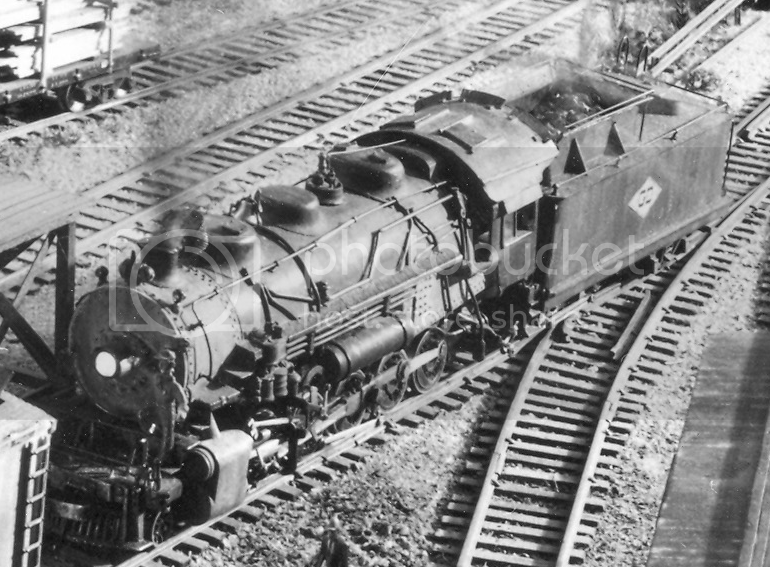 It is said his engines were based around a prototype of Rock Island and Missouri Pacific, but I see a ton of ATSF and D&RGW prototype thrown in for taste. As for the photos, he was an avid photographer and each photographer has his own style of lighting and so forth. My favorite technique is one used by George Selios which uses fluorescent and incandescents mixed and balanced together to give off a sunny and cloudy lighting tint, where it is not too yellow and not too white.